Send sweet California sunshine with this hand-woven, wicker gift basket filled with Beurre Bosc, Red Sensation and Imperial Comice Pears, plus Fuji and Granny Smith Apples, Navel Oranges, Kiwi and more! How do you know they’re undoubtedly delicious? Because they’re from the fertile fields along the lush River Deltas of Northern California, that’s how. A healthy, refined gift that’s a statement of style and truly good taste, this real hand-woven willow gift basket is filled with the orchard’s best including Buerre Bosc, Red Sensation and Imperial Comice Pears, plus Fuji Apples, Navel Oranges and even Kiwi. Mom will love it! 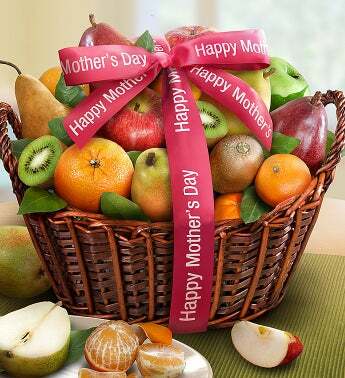 Arrives orchard-fresh, ripe and ready to eat and tied with a Happy Mother's Day gift ribbon! Show Mom your love when you send sweet California sunshine to her with this hand-woven, wicker gift basket brimming with Beurre Bosc, Red Sensation and Imperial Comice Pears, plus Fuji and Granny Smith Apples, Navel Oranges, Kiwi and more!